Typical condensed phase experiments at the Australian Synchrotron Far IR & HR beamline utilise the wide spectral range and high intensity of the synchrotron source. Condensed phase samples can be supported/mounted for analysis in a number of different ways. For the study of samples that can be pressed into disks or pellets 13 mm in diameter (see Sample Types). Note that a pellet press is available in the Chemistry Laboratory. 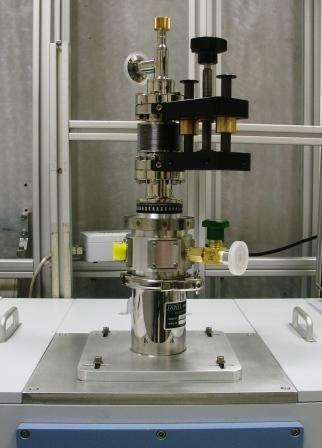 Please inform IR Beamline staff if you require access to this instrument to press your samples. We currently have two cryostats, for discs 13 mm in diameter. Ideal for the study of phonon modes in cryogenically-cooled crystals. We have a Janis research cryostat and a Closed loop, Pulsed tube Cryostat from Cryo Industries. The Janis system has 3 sample positions and is generally used at liquid nitrogen temperatures. The Cryo Industries system has four sample positions and is designed for use at near liquid helium temperatures. The Cryostat (Janis Research); shown mounted to the sample compartment of the Brüker IFS 125HR FTIR spectrometer. The sample clamp; for samples 13 mm in diameter. Can hold up to 3 samples at a time. 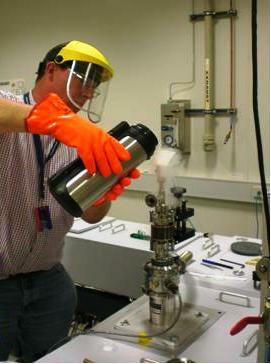 Robert Falconer, University of Queensland, shown cooling the Cryostat with liquid nitrogen. The cryostat (Cryo Industries); shown mounted to the sample compartment of the Brüker IFS 125HR FTIR spectrometer. This cryostat features diamond windows. For the study of thin films or monolayers. Ideally samples should be uniformly deposited on a gold- or aluminium-coated microscope slides, 3“x1” in size, however sample masks are available for irregular sized samples (see figure 14). Contact IR Beamline staff for more information. The grazing angle of incidence can be varied between 30° and 80° in 1° increments. Figure 13. 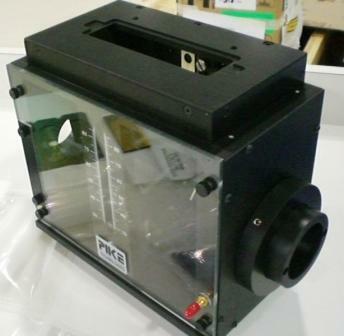 The Grazing Angle Incidence (GIA) cell (PIKE Technologies). The whole cell is placed into the sample compartment of the spectrometer and your sample slide is placed face down on top of the accessory. Figure 14. A series of masks to hold GIA samples. Mask dimensions: a, 1.25x3"; b, 1x3", c, 0.615" aperture; d, 0.372" aperture. Gold-coated reference (e, 1.25x3") and sample (f, 1x3") slides are shown (Thermo Scientific). 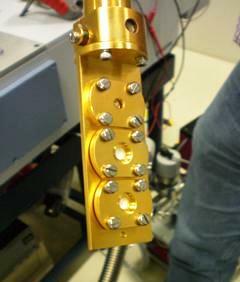 Side view of optical path, the gold slide, covered with sample, is face down at the top of the image. Polyethylene (PE) < 400 cm-1 Two particle sizes, 150μm and 30μm are available, please discuss with your beamline scientist your requirements. The suggested experimental method for you requires you to press your sample into pellets. A vacuuable automatic, touch screen pellet press is available for use. Please contact your beamline support scientist for booking and details. Disk diameter: 1, 3, 7 and 13 mm dies are available at the Australian Synchrotron. Above is the 13mm die set. Below, the 7mm die set is for use with the hand press. The amount of sample you require depends on the sample itself and how much it absorbs in the far-IR. As a rough guide 15mg per sample with 30-50 mg of KBr powder is normal. But I stress that it is sample dependant. The powder sample and KBr must be ground to reduce the particle size to less than 5 mm in diameter. Otherwise, large particles scatter the infrared beam and cause a slope baseline of spectrum. KBr is hygroscopic so make sure to put the powder back in the dessicator at the beamline when finished. A typical pressure and pressing time for KBr is 9 tons for 10 minutes. As with KBr, the amount of sample you require depends on the sample itself and how much it absorbs in the far-IR. As a rough guide 15mg per sample with 30-50 mg of PE powder is normal. But I stress that it is sample dependant. You would get the best results if you can press the pellet entirely out of sample (~50mg) but usually the sample doesn’t bind enough to make a pellet, or it absorbs too strongly in the IR. If it is a strong absorber, then you might be able to use only a few mg of sample per pellet. Ascertain the amount of quantity of powder you need to prepare your sample. The body with a detachable base, a plunger, and two polished steel anvils/pellets (please be aware that these pellets have two different sides; (only the polished side should be kept in contact with the sample). Put the die set on the press and press for desired time. In some cases you might want to try heating your pellet, or the die. There is access to both an oven and a furnace in the chemistry laboratory. Please make sure you remove any o-rings before heating the die. For PE the melting point is around 105-120 up to 180, please make sure your samples can withstand this kind of temperature. Please consult your beamline scientist before using this equipment. Training is required. There is a glovebox located in the chemistry laboratory that can be purged with nitrogen or other kinds of gas, for samples sensitive to air. The dies can also be evacuated. This produces a more even pellet. A hand press is avbailable with 1mm, 3mm and 7mm dies. Use of the small pellet size is usually required when large amount of samples are difficult to come by - because they are expensive materials, or materials that are difficult to synthesize; using this technique/approach with pure samples has the advantage of avoiding optical effects due to the binding material and the added advantage of sample recovery. If you are planning on using any of these methods, please request more sample preparation (offline) time in your proposal.